Day two of our PiP photo vote off is here. If you missed voting yesturday, don't worry. The poll will be open until Sunday morning. oh another good vite off....all good pics but I had to go with B.
I'm going to go with B, because I really like the gentle way Anderson is touching the elephant with the back of his hand. It's so sweet, it warms the cockles of my heart. I'm reading the other comments now, and I see that Sapphire feels the same way. Hmm...it's hard to choose, I really love b,c, and d - there he goes again with the hands on the hips. Gotta give this one some more thought. "B" has been one of my favorites since these pics have been posting. 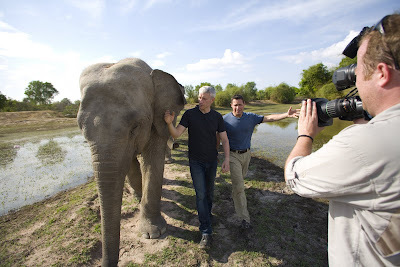 I think it's a very sweet picture walking with an elephant and Anderson's hand touching it makes it even more sweet. 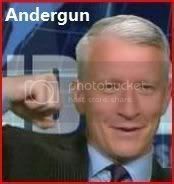 AC360_1030.jpgA TVNewser tipster tells us a round of layoffs hit Anderson Cooper 360 this afternoon. CNN confirms seven producers from the show are being laid off. A spokesperson tells TVNewser, "The format of AC360 has evolved over the last year and we are adjusting staff accordingly. A very small portion of the staff is impacted and we are hopeful they will remain with CNN." This summer AC360 implemented a format that is live for the first hour (10pmET) and remains live or partially live for the second hour (11pmET). Wow, these are tough choices! I was wavering between C and D (yeah, the Hero pose does it...) and put off a decision by reading the comments, and I have to agree, B is a good one, too. And artistically, A is set up perfectly. @sapphire, you're right, I love the pic of AC with his hands on hips especially with those temporary tattoos, it makes him look so very um...real (for want of a better word )& rugged? 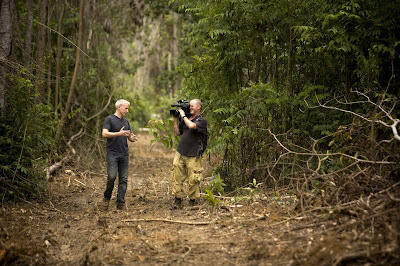 "D" is the epitome of Mr. Cooper in his element in the field: hand on hip, camera in hand, contemplation on his face. Perfection! My first choice was D...But B, with Anderson touching the elephant is so sweet! I've been wondering for a while what kind of cost savings they could have with the one-hour vs. two-hour format, assuming that most of the staff would be salaried (though I don't know that business and there could be other savings than personnel). I'd say this is one of the biggest savings they'll have with the layoffs, and they're doing it now that they know the one-hour format will work and is the direction they're going. I'm surprised, however, that they did it with Anderson out of the country, but ultimately I guess the people work for CNN and not AC. Ahh! I thought was the same pics, I voted mistakenly but, oh! hell yea! Anderson with his hands on his hips... way to go babes!